The modern Moscow painter, to this day pleasing the viewer with his historical canvases, Victor Matorin, has a bright artistic personality, originality of the writing style, and exceptional talent. One of the best paintings of the artist, with historical value can rightly be a portrait of the Grand Duke. The key historical figure of Dmitry Donskoy cannot be overestimated, the plot of the picture Matorina reveals the inner state of the hero on the threshold of the most important event of his life. Determined, Dmitry Donka holds his right hand to his heart, gathering his courage on a new military campaign. His serious, focused about directed away, intently, with a touch of an important Duma, he looks through the viewer. A confident posture, firmness of spirit around Dmitry Donskoy create an atmosphere of awe before the Grand Duke, faith in the strength of the army, in the early victory over the enemy. Some straightforwardness and at the same time complete openness, purity, are visible in his image. Tempered willpower is transmitted by a tired but determined face, wrinkles from a serious eyebrow. The combat clothing of the prince shimmers in the sun, harmoniously echoes his skin tone. Large elements of his clothing emphasize the gigantic, strong figure of a warrior. Everything in the image of this person speaks of his unswervingness, striving to defeat, no matter what, at the same time, of exceptional rationality and coldness of mind. 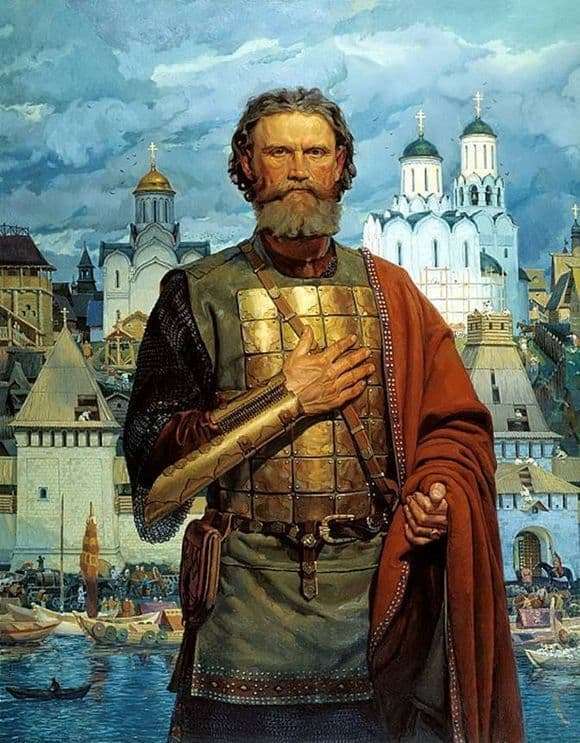 The prosperous, big and noisy city, depicted against the background of the prince, is building new churches, houses, flourishing – and all this thanks to Dmitry Donskoy, whose soul is overflowing with love for his native lands, for which he is ready to fight to the bitter end. Particular attention should be paid to the uncovered head of the prince, which symbolizes his fearlessness before death for his beloved people.